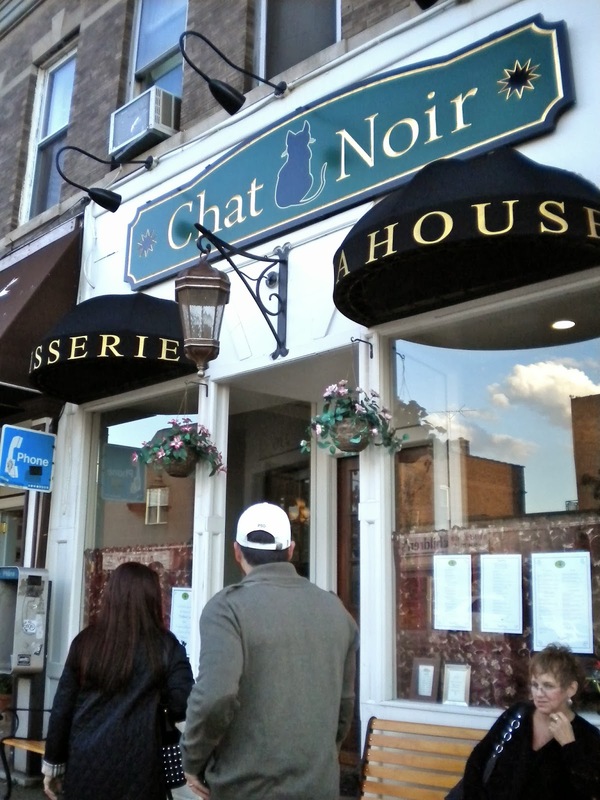 On a recent Sunday, my girlfriend and I had brunch at Chat Noir in the bustling village of Rockville Centre before seeing a movie in town. Chat Noir is a traditional tea house with a French twist. They have a very extensive tea selection, and in true teahouse fashion the tea is served in an antique porcelain or ceramic tea kettle with a floral design. For your first visit, I definitely recommend ordering a "Tea Service." 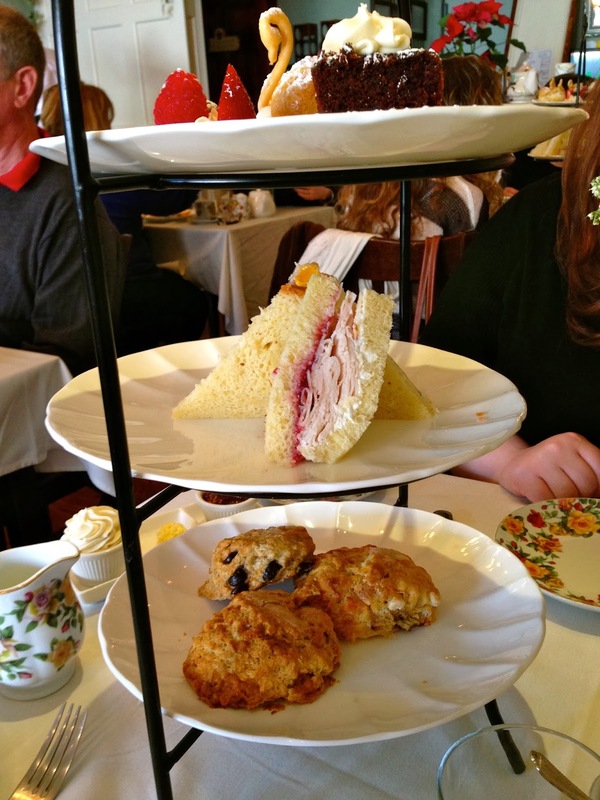 At $22 "per person," the tea service includes a pot of tea, a selection of finger sandwiches, assorted scones and assorted pastries. All this is attractively presented on a three-tiered serving platter that makes a statement as it is paraded through the dining room and placed on your table. Trust me, it is way too much for one person, especially if you want to try anything else on the menu, so just order one Tea Service to share. Our Tea Service included three delectable pastries: a cream puff in the shape of a swan, chocolate cake, and a custard tart topped with berries. The finger sandwiches were served on crustless egg bread, one was turkey, goat cheese and cranberries, another was the classic cucumber, and finally a ham and apricot jam pairing. For the scones, we had blueberry, what seemed like peach and white chocolate (to die for), and another was I believe cinnamon or maple. I really enjoyed everything on the platter, and it was very filling, even after splitting it with my friend. And how could I forget the clotted cream that is served along with the scones? Oh.my.God. that was good. It's a very thick cream that you spread on the scones. Chat Noir's has a nice vanilla flavor and is totally addictive. For our tea we chose the Maple Sugar, which was really delicious. Of course there were plenty of flavors I would love to go back and try. Even though we really didn't have much room by the time it arrived, we also ordered the Caramelized Onion & Goat Cheese Tart, which is served with a side spinach salad. This was really delicious but very rich. Savory, sweet and creamy, I would recommend sharing this with a friend like I did. The tart is crusty on top but soft in the middle, and very rich and creamy. It seemed as if egg or cream was added to that tart in addition to the goat cheese, which made it feel very heavy. But it was tasty! I recommend stopping by Chat Noir for a nice tea brunch or a romantic dinner date. A FOOD.D in Philly - Take the Tour With Me!